, an eminent dissenting minister in Ireland, was born Oct. 19, 1680: his father was a dissenting minister in Colraine, his mother a Walkiushaw of Renfrewshire, in Scotland. In 1689 he was separated from his parents; his father having been employed by the Presbyterian clergy to solicit some public affairs in London, at a time when his mother, to avoid the tumult of the insurrections in Ireland, withdrew to Derry. He was at this time with a relation, who in that general confusion determined to remove to Scotland; and having no opportunity of conveying the child to his mother, carried him along with him. Thus he happily escaped the hardships of the siege of Derry, in which Mrs. Abernethy lost all her other children. Having spent some years at a grammar-school, he was removed to Glasgow college, where he continued till he took the degree of M. A. 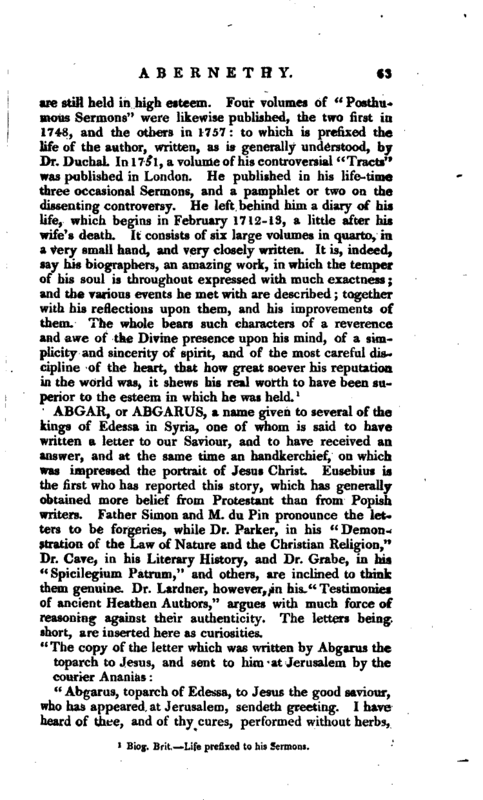 His own inclination led him to the study of physic, but he was dissuaded from it by his friends, and turned to that of divinity; in pursuance of which he went to Edinburgh, and was some time under the care of the celebrated professor Campbell. At his return home, he proceeded in his studies with such success, that he. was licensed to preach by the presbytery before he was 21 years of age. In 1708, having a call by the dissenting congregation at Antrim, he was ordained. His congregation was large, and he applied himself to the pastoral work with great diligence. His preaching was much admired; and, as his heart was set upon the acquisition of knowledge, he was very industrious in reading. In 1716, he attempted to remove the prejudices of the native Irish in the neighbourhood of Antrim, who were of the Popish persuasion, and bring them over to the Protestant faith. His labours were not without success, for several were induced to renounce their errors. | About the time the Bangorian controversy was on foot in England, encouraged by the freedom of discussion which it had occasioned, a considerable number of ministers and others, in the North of Ireland, formed themselves into a society for their improvement in useful knowledge. Their plan was to bring things to the test of reason and scripture, without having a servile regard to any human authority. Abernethy pursued this design with much zeal, and constantly attended their meetings at Belfast, whence it was called the Belfast society. Debates, however, soon grew warm, and dissensions high among them, on the subject of requiring subscription to the Westminster confession. This controversy, on the negative side of which Abernethy was one of the principal leaders, was brought into the general synod, and ended in a rupture in 1726. The synod determined, that those ministers, who at the time of this rupture, and for some years before, were known by the name of non-subscribers, should be no longer of their body: the consequence of which was, that the ministers of this denomination found everywhere great difficulties arising from jealousies spread among their people. 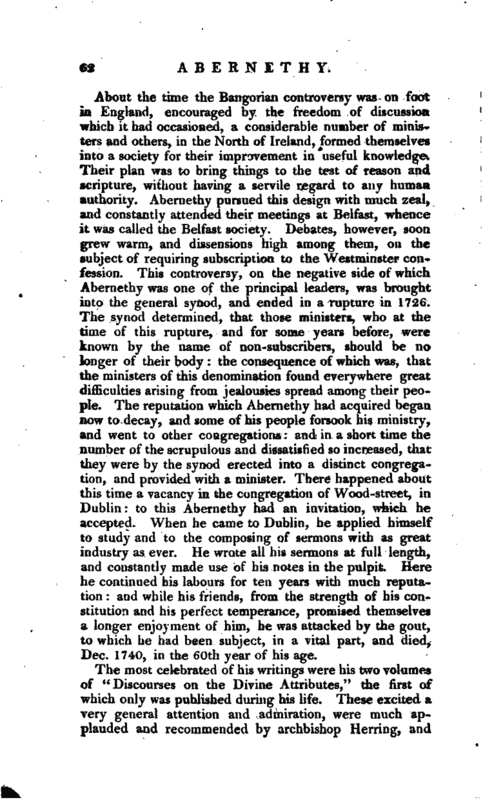 The reputation which Abernethy had acquired began now to decay, and some of his people forsook his ministry, and went to other congregations: and in a short time the number of the scrupulous and dissatisfied so increased, that they were by the synod erected into a distinct congregation, and provided with a minister. 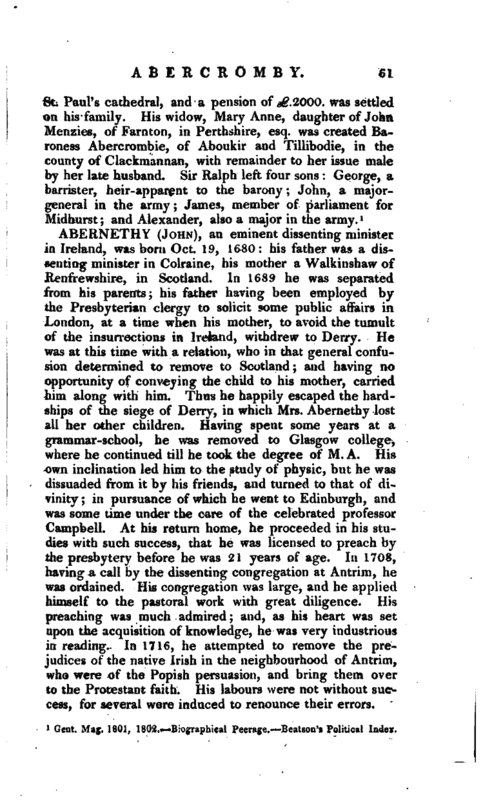 There happened about this time a vacancy in the congregation of Wood-street, in Dublin: to this Abernethy had an invitation, which he accepted. When he came to Dublin, he applied himself to study and to the composing of sermons with as great industry as ever. He wrote all his sermons at full length, and constantly made use of his notes in the pulpit. Here he continued his labours for ten years with much reputation: and while his friends, from the strength of his constitution and his perfect temperance, promised themselves a longer enjoyment of him, he was attacked by the gout, to which he had been subject, in a vital part, and died, Dec. 1740, in the 60th year of his age. Biog. Brit.—Life prefixed to his Sermons.